"Forgotten are the gods who warred and why the ruin followed"
A post apocalyptic serial that explores identity and fixation, told from the perspectives of the denizens of three nations. In the wake of the Rack and Ruin untold species unite to survive in a landscape of extremes. Though the gods are dead, they left behind their fetiches--instruments of obsession and fate. 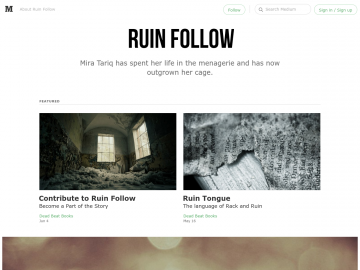 Ruin Follow has not been reviewed yet. Ruin Follow has not been recommended yet.